It’s never a good idea to try and fix your own air conditioner – even if your Uncle Robert says he fixed his own AC so you could do yours. Air conditioners are just like any other complicated electrical appliance – they require a certified and licensed technician to maintain, diagnose, and repair. Here are a few reasons why you should call an air conditioning company rather than fix your AC yourself. Maybe the most important reason you shouldn’t fix your air conditioner yourself is that it can be a hazard to your safety. If you’re not sure what you’re doing then you may touch something that has an electric current going through it and get a fatal shock. Also, if you fiddle with something you shouldn’t, it may affect the way your AC system operates and you will probably make the problem worse. Rather call a qualified AC company to get the job done right. Another reason you shouldn’t try to fix your air conditioner yourself is that the majority of AC warranties state that only licensed technicians should service or repair the units. If you attempt to fix the issues yourself, the warranty may become void. Do you suspect the refrigerant in your AC is low and think you can simply go buy some and put it into your AC unit? The problem with this is there are very specific requirements that need to be followed when handling a refrigerant. Also, the low refrigerant could be due to a leak and instead of adding refrigerant you should have the leak repaired – only an AC technician would be able to diagnose this and have access to the correct parts to fix the problem. Rather leave it to them to correctly order and install any AC parts that may be needed to repair the unit. Your AC unit may have more problems than you expected. If it is acting up, you may think it is an easy fix like flushing the lines, or changing the filter, but sometimes there is a more serious problem. For example, you may think a low refrigerant is to blame for your unit not working effectively, but it could also be due to faulty wiring, or the outside fan not working – and in some cases it may be a combination of all 3! Only a trained AC technician has the knowledge to be able to diagnose the whole problem. An AC technician has all the necessary tools required to fix and maintain any AC system and is also able to advise you when it is time to replace the unit. Complex issues can arise with your AC system – problems such as a faulty thermostat or a broken fan are difficult to diagnose and fix yourself. The AC technicians at Art Plumbing, AC & Electric are trained on how to diagnose and fix the complicated issues surrounding your AC system. Our qualified, certified HVAC service technicians have the experience, skills and tools to fix your HVAC problems correctly the first time. 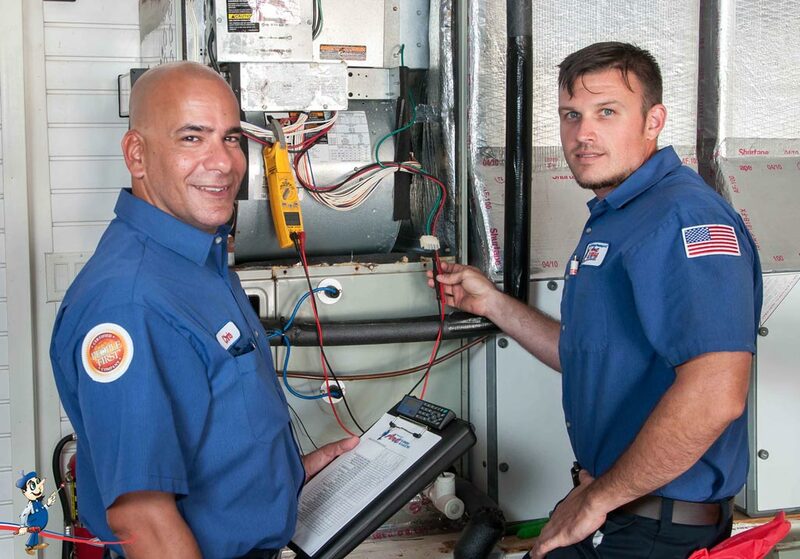 At Art Plumbing, AC & Electric we are fully licensed and insured for AC repair, maintenance, and installation – don’t tackle your AC repairs yourself instead call the professionals – Art Can Fix It! Home AC Zones: How Do They Work? How Do Irrigation Controllers Work? Electrical Problems: What Is That Buzzing Sound?